Dental implants replace your tooth’s root, restoring function and aesthetic to your smile, without jeopardising the health of your jawbone. Read on to find out more about dental implants, the best option for a missing tooth. Dental implants are made up of 3 components: the implant (placed into the jawbone), the restoration (the aesthetic part of the crown such as a crown) and the abutment (the connecting element linking the implant and restoration. The implant is made from titanium, a highly biocompatible material that is very rarely rejected by the body. Your dentist will surgically place the implant into the jawbone and leave it to heal over for a period of around 6 months. 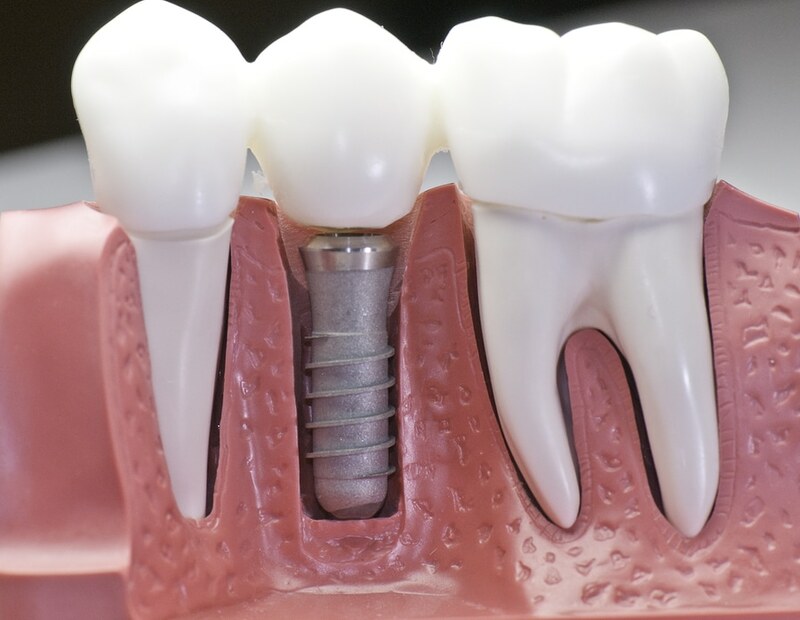 Once it has healed the restoration can be placed over the top and the abutment will be the connecting piece between the implant and your restoration. Here at Cliftonville, many patients favour a CEREC crown as a restoration for their dental implant, offering the highest level of function and aesthetic. Unlike dentures, dental implants are a fixed solution and the titanium implant fuses with your jawbone to become a permanent part of you. Dental implants eliminate any chances of resorption which occurs when a patient has dentures – resorption refers to when your jawbone shrinks as a result of your jawbone not receiving the stimulation it needs. A missing tooth can impact a number of aspects of your life. Breaking down foods can become a challenge, especially if you have multiple missing teeth and if you follow a particular diet such as raw food, vegan or vegetarian, you may have to make amends to this until you treat the vacant gap in your smile. If you have a missing tooth that was previously part of the ‘social six’ (the teeth the most visible when you smile), it may put you off wanting to smile at all, affecting your mental wellbeing in the long term. If you would like more information about dental implants here at Cliftonville, please do not hesitate to get in touch.